In early March I took a lovely vacation to Florida to visit my parents and Disney World. I had a great time with Mom and Dad, exploring wildlife(manatees are sweet creatures) and touring such oddities as Ca’ d’Zan, the former mansion of the circus promoter John Ringling. The Alfonso Cuaron version of Great Expectations was filmed in part in that mansion, before it was restored by historical preservationists. The decrepitude of the long-forgotten mansion enhanced the shabbiness of the art direction of that film. The most peculiar and exciting film-related objet d’art I saw during my vacation has got to be the attraction Captain EO, at EPCOT Center in Disney World. If you have never been to Disney World, you may not be aware that in 1986 Michael Jackson teamed up with Francis Ford Coppola and George Lucas to create a short film attraction at EPCOT. Yes, you read that correctly; I am not making this up. I remember seeing the film as a young girl and liking it. I did not realize until this trip that it was made by those masters of film. Can one imagine a hot director like Steve McQueen directing a short film with Beyonce for an amusement park nowadays? No, but back in the ’80s times were different and boy am I happy this merry trio made such a weird and wonderful production. If you look closely at the picture of the poster, which I took, you will notice something very strange. The poster is housed within a regular old case and is damaged. The left-hand side is slightly ripped; this is decidedly un-Disney. Disney prides itself on creating magic within it’s parks. No details too small are overlooked; everything is pristine and as near to perfect as one can get. 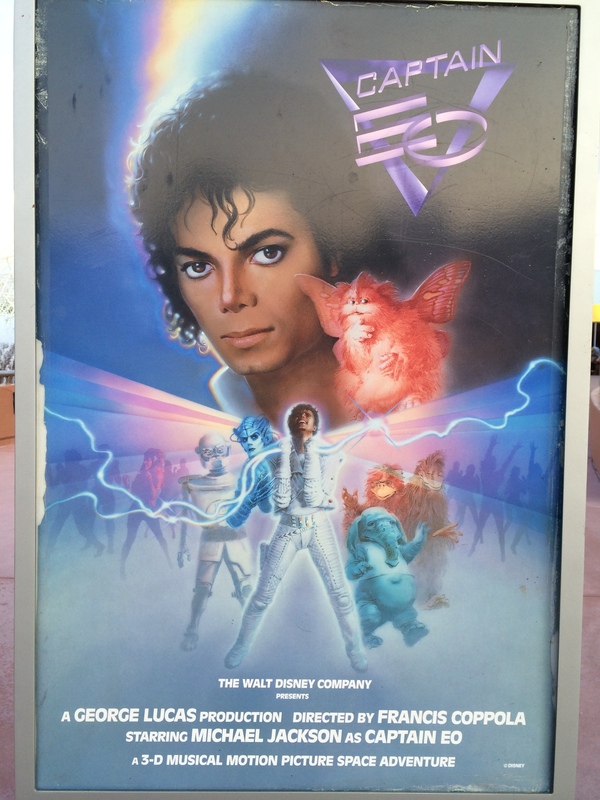 Unless one is at the Captain EO theater; then it’s like, ‘go see this movie or whatever, we don’t care.’ It’s abundantly clear that Disney was reluctant to bring back this film and did it only to placate Michael Jackson fans, after he passed. This is the ONLY place at Disney World in which you cannot buy a souvenir of the attraction. Gift shops abound at Disney World, but nary a small Captain EO t-shirt could be purchased to commemorate this film curiosity. Trust me, I tried to find anything; my husband and I viewed the film twice, but no luck with merch. Instead of assessing this film with regular criteria, as it is a unique experience, I will give my notes on this film stuck in time. You enter the Captain EO theater and grab a pair of 3D glasses. Then all of the viewers stand in a pre-staging area to view the original ‘behind-the-scenes’ film on the making of Captain EO. I recall as a kid this area being very crowded. In 2015, it was a sparsely attended group consisting of Michael Jackson fans, Gen X-ers(me), parents with tuckered-out kids and random tourists who wanted to avoid the harsh sun. You then watch the production video highlighting the, at-the-time, advanced 3D camera used, the art designers and rehearsals with Solid Gold-style dancers. When the video ends, you are ushered into another theater with seats and the film starts. The theater itself also shows the lack of care which Disney put into this returning attraction. In its original form, the theater was enhanced with plastic whip-like objects which would touch your legs and air jets which would blow back your hair at specific parts of the film. Additionally, there were lights within the theater walls that would flash, if a laser blast was on screen. In 2015, most of these elements are gone, simply taped over with duct tape. Finding two chairs together with fully functioning features was not easy. The only thing Disney took care of in terms of this attraction, was the film. To my eye and with my 3D glasses (some of them are warped; select wisely) the original 70mm print looks pristine. At least they archived the actual film in the correct way; I’ll give Disney a pat on the back for that. I will try not to spoil this child-like, sci-fi, music video bonanza for those who plan to visit EPCOT soon(I don’t see this film remaining much longer); I will highlight the memorable parts. After you put on your 3D glasses, the film starts with Michael Jackson starring as Captain EO, who is in charge of a rag-tag group of goofy space creatures on an important mission. Think pre-Jar Jar Binks-type characters and corny banter with Captain EO about doing a good job and believing in themselves. Little kids eat this stuff up, plus the 3D effects, so forgive the first few minutes of the film; it’s for the children. Then, inevitably, Captain EO’s crew crashes on an un-friendly planet and has to face their punishment for trespassing. This section was were the film greatly improved. The crew’s encounter with the Supreme Leader of this planet could be seen by children as ultra-terrifying. Think of a much scarier version of the Borg Queen; a villainous creature who is suspended in the air, made of tubes, with talon-like nails. She sentences Captain EO and his crew is various awful punishments and then the magic starts. Captain EO offers the hideous leader a gift before he and his crew serve out their sentences; a gift to unlock her inner beauty. This is when Captain EO becomes a straight-out Michael Jackson music video. His crew transforms into a band and he sings an original song ‘We Are Here to Change the World’ and it is glorious. It’s Michael Jackson at his best, at his peak; entrancing and really, really cool. I absolutely had one glove as a child and totally watched his videos all night when he died. I can’t deny that I was delighted by this film. He shots brutish robots with lasers and they become athletic back-up dancers; that was fun for my young self and remains so today. The film ends with a segue into ‘Another Part of Me‘, which was on the album ‘Bad’. Yes, a Disney attraction features a song off of one of the most popular albums of all time; that’s wild then and still is in the present. The finale of the film has the Supreme Leader transforming into a beautiful woman in colorful flowing garments, who just happens to be Anjelica Huston, waving to Captain EO and his crew. He has delivered on his gift of beauty and dances off the screen, to new adventures. The lights in the theater come back up and the Disney theater usher welcomes the audience back to 2015. Michael Jackson may be gone and Disney may not want to seriously invest in the upkeep of such a retro attraction, yet the peculiar enchantment of Captain EO prevails. Hi there Readers! This post is a little reminder about general movie theater etiquette and safety. Theater etiquette has become lax of late, which many are aware of. Think about how often you go to a film and someone is chatting or texting throughout; not very courteous. 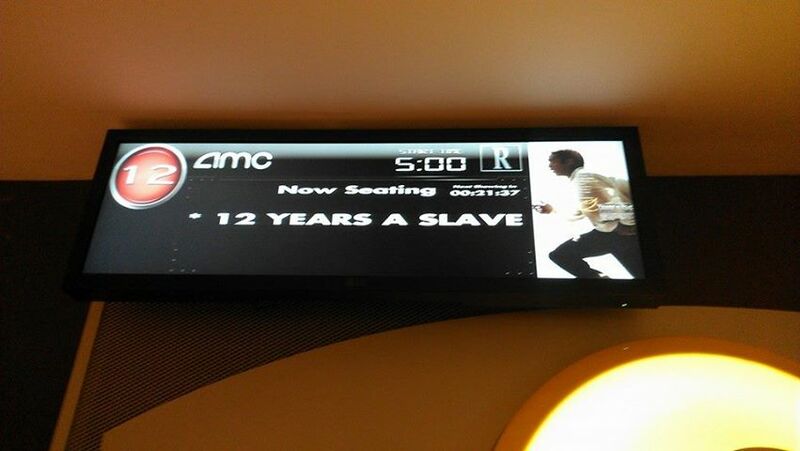 I went to see 12 Years a Slave, which I highly recommend, on October 23 and there were some curt words spoken between patrons over poor behavior. One young gentleman had to firmly explain to a woman about why her texting was distracting. Two others yelled at each other, “SHHHH, BE QUIET!” which was replied to with a “YOU don’t tell ME what to do!” Ah, the pleasures of an NYC film audience. 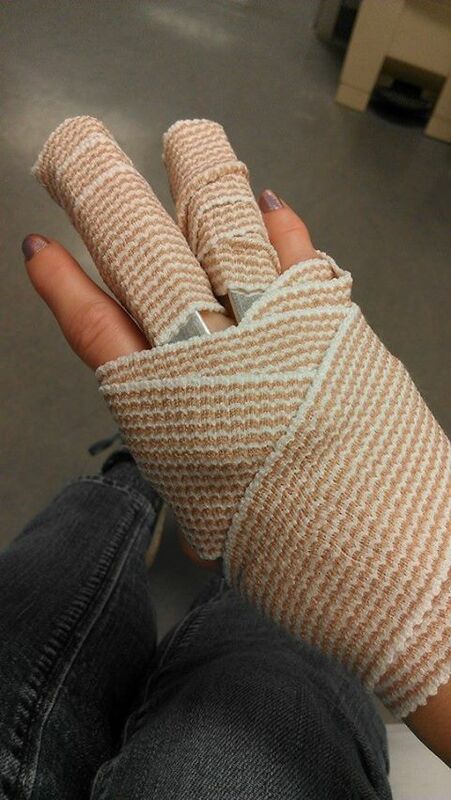 I also had a mishap.